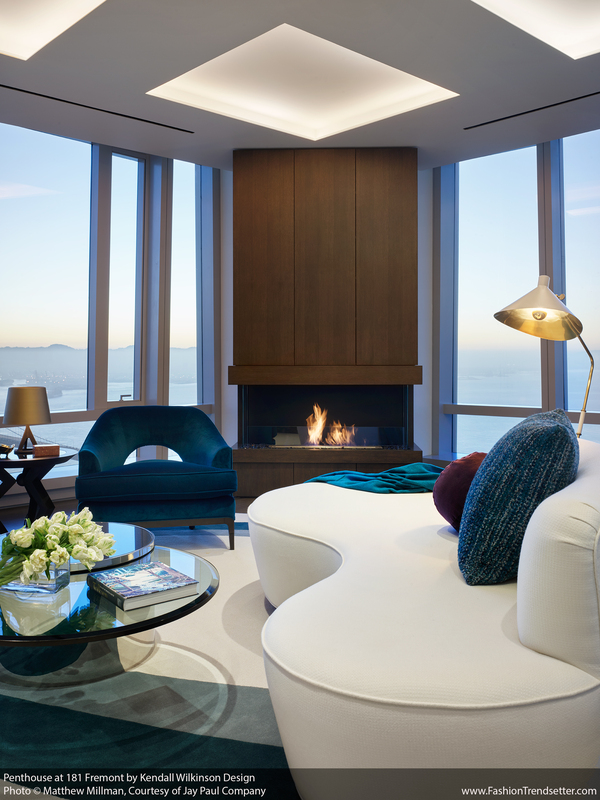 Jay Paul Company is pleased to present its newly released fully-furnished, custom-designed Penthouse at 181 Fremont -San Francisco’s most exceptional address. 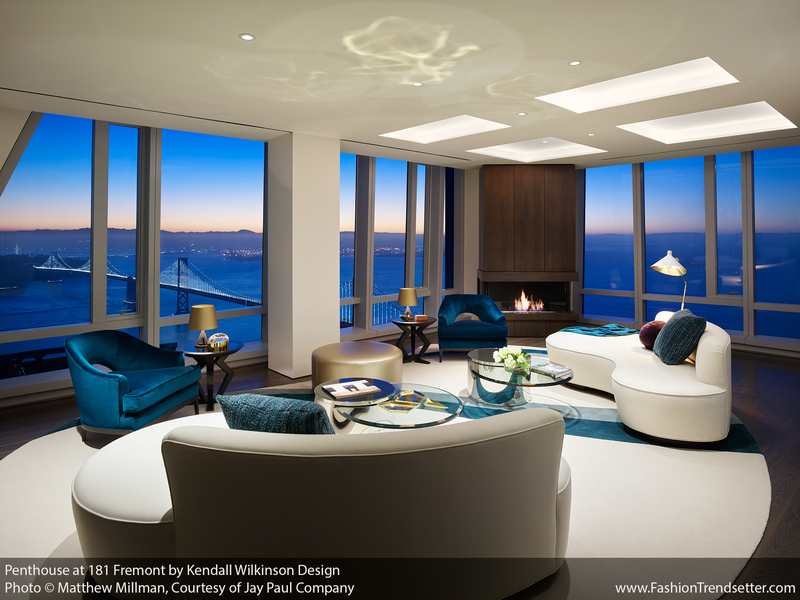 Designed for the most discerning buyer by renowned Kendall Wilkinson Design (KWD), the half-floor residence enjoys unprecedented 180-degree, floor-to-ceiling views across the City and beyond the bay. 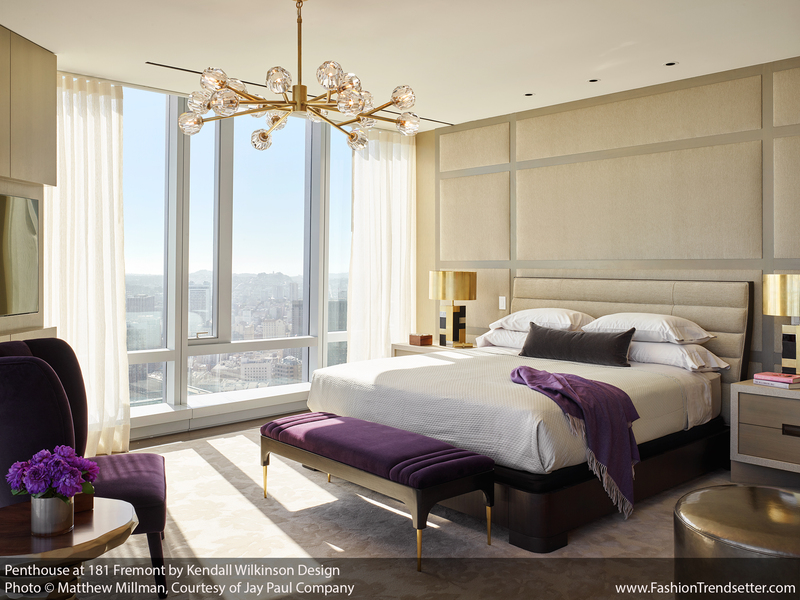 With 3,256 square feet of glorious space, the home reflects a contemporary interior using timeless elements of balance and texture with traces of the designer’s signature glam. 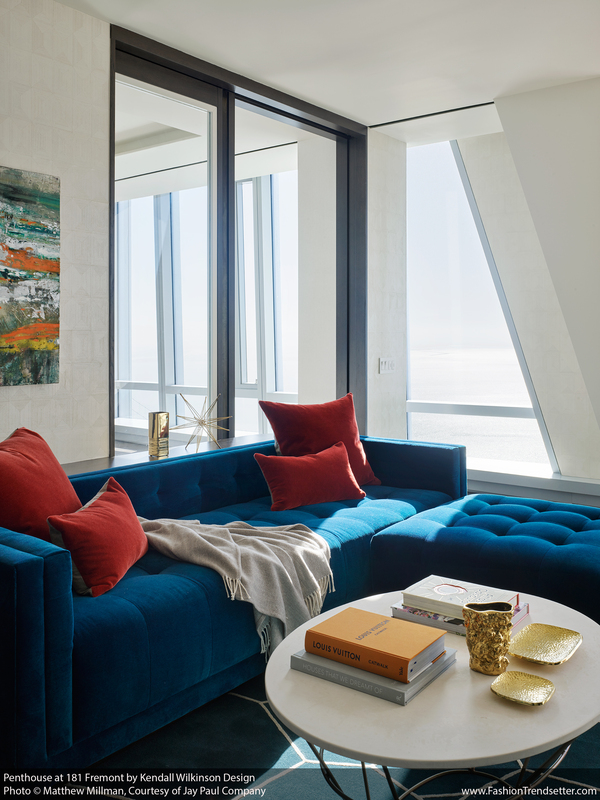 The move-in ready penthouse, which sits more than 700-feet into the sky, encourages private living on a grand scale, with unparalleled finishes including museum-style walls, and rare sweeping views of San Francisco – all included for $15.5 million. 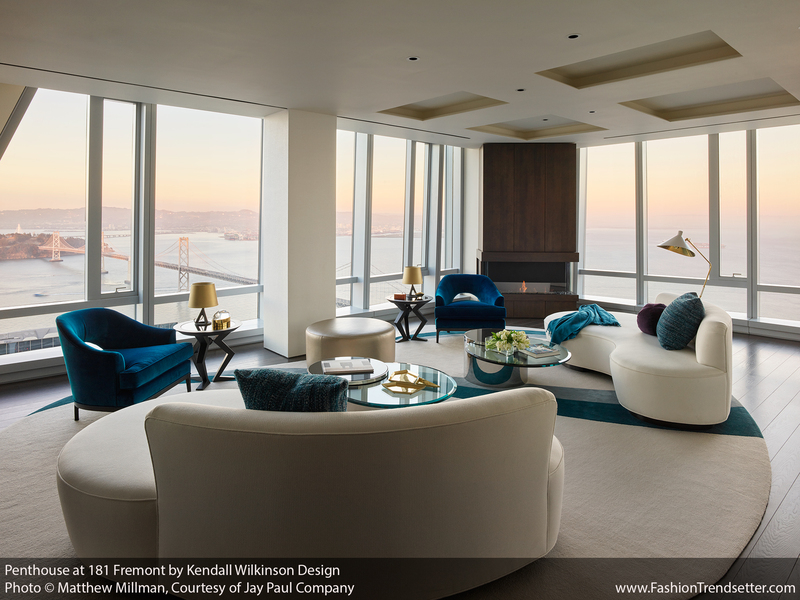 With its incredibly expansive views of San Francisco, the Bay Bridge, Sutro Tower, Mount Diablo, and beyond, the penthouse at 181 Fremont encapsulates the magic of the City. 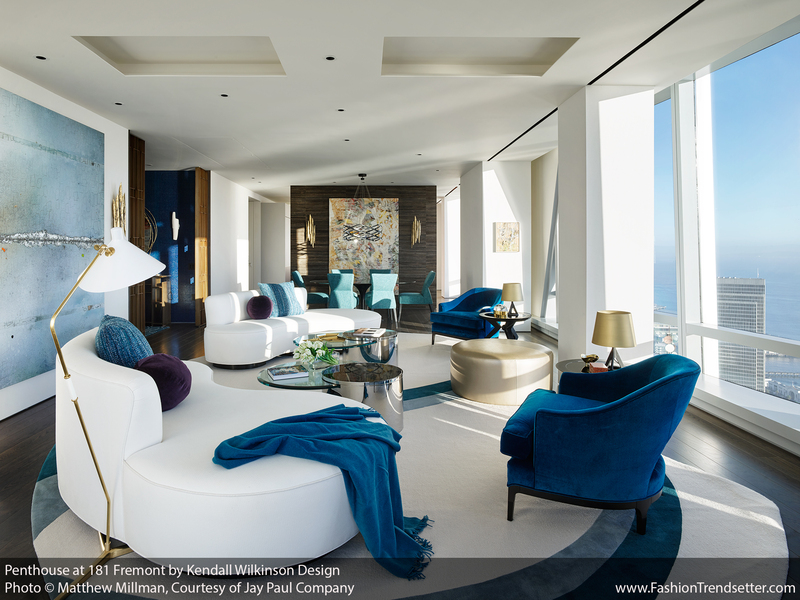 We sought to harness this romanticism while balancing the building’s strong architecture by creating a highly customized residence rich with texture and soft, curvaceous furniture. 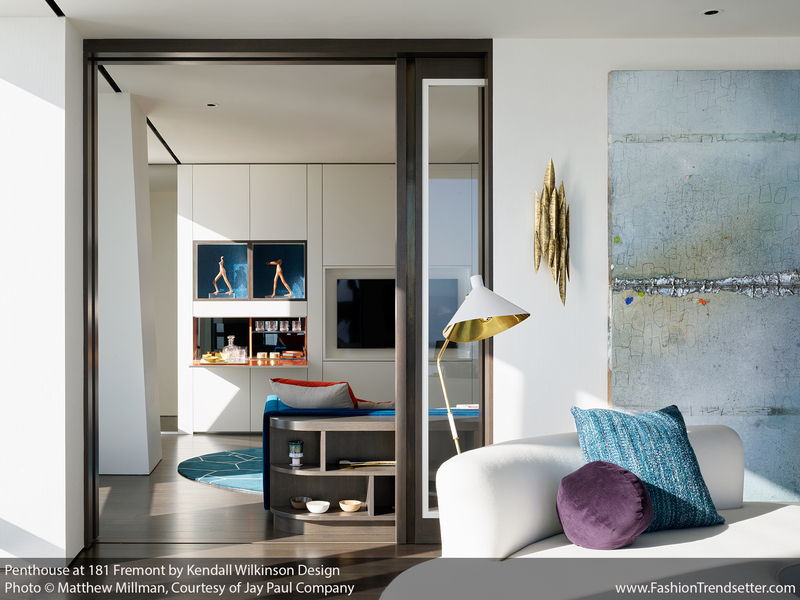 The penthouse is an ultra-luxurious and expansive home with stylish touches that invites buyers to entertain and enjoy the beauty of their surroundings for years to come. 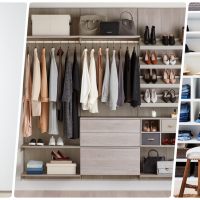 Thoughtfully and meticulously designed, the home features a contemporary look with soft lines to complement the striking angles of the building’s architecture. 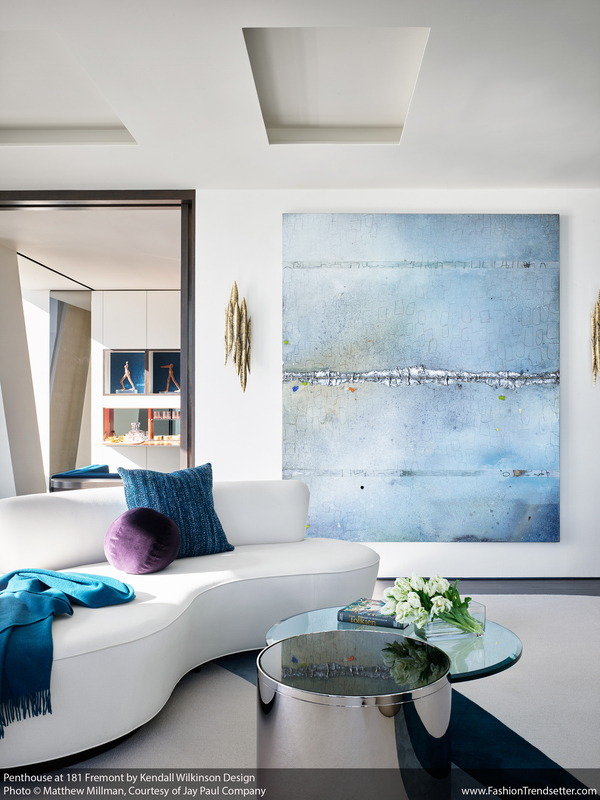 The residence infuses classic Old-World glamour with vibrant pops of color and displays a sample collection of artworks on loan from Susanne Vielmetter Los Angeles Projects, all curated by 181 Fremont’s art consultant, Holly Baxter. 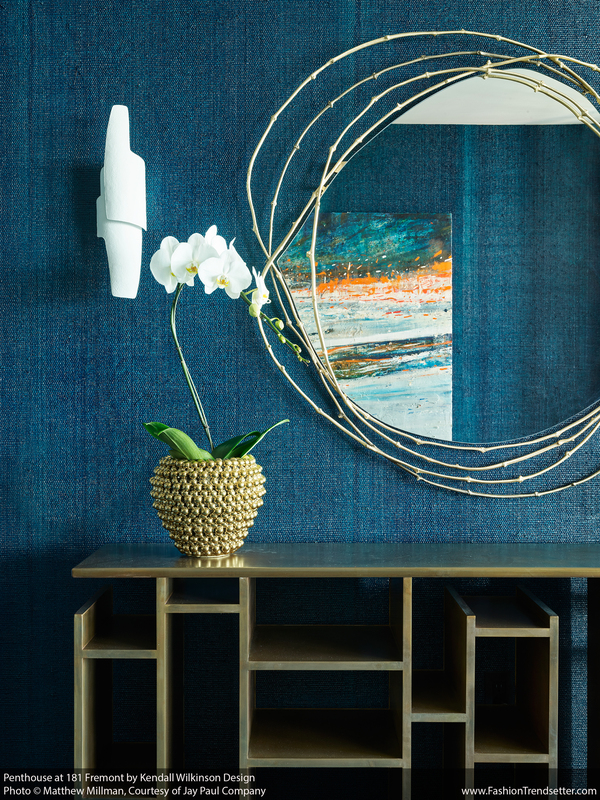 Upon entering, residents and their guests are welcomed into a formal lobby adorned in a dramatic, textured turquoise wallcovering by Phillip Jefferies – showcasing KWD’s signature glamorous style. 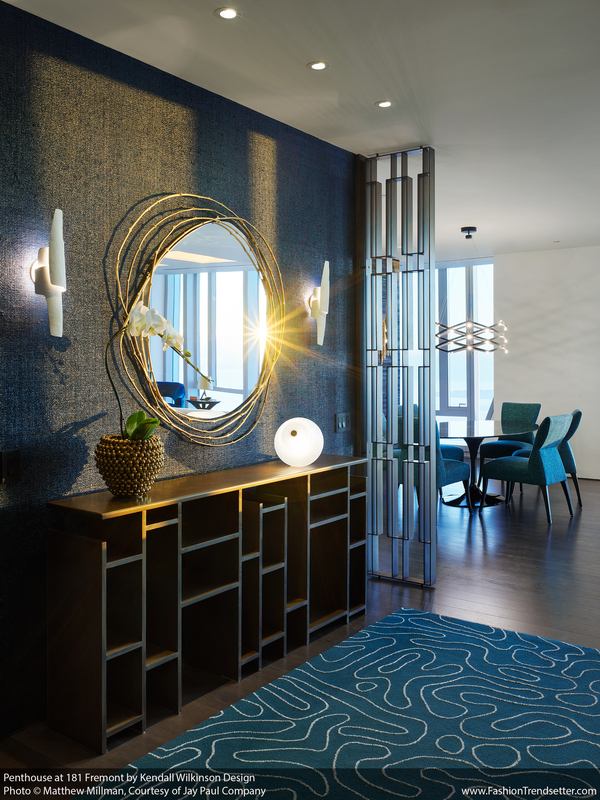 Furnishings in the lobby include a custom geometric brass console and a pair of fretwork brass screens to define the space, providing a graceful entry into the home’s living quarters. 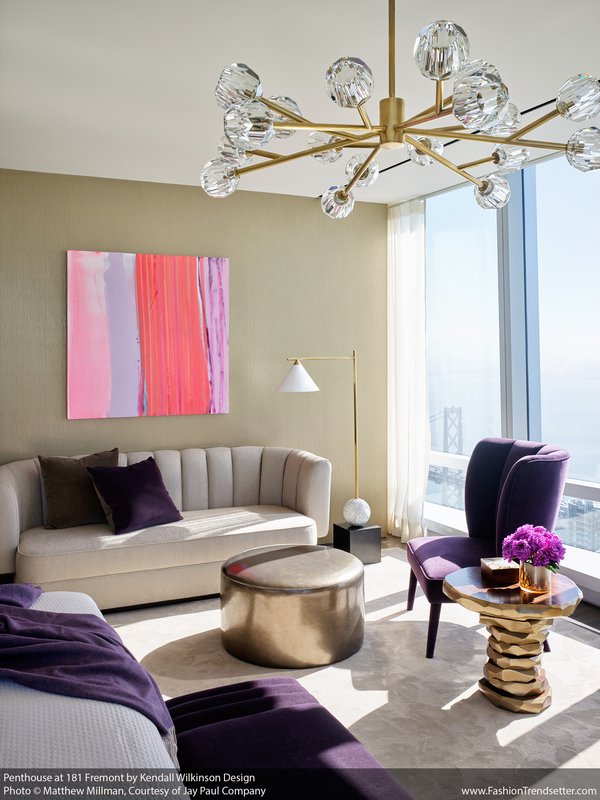 Decorated with soft and curvaceous furniture, cream textured wallcoverings, custom Porta Romana sconces, and a mixed-media painting by Bay Area artist, Hugo McCloud, the living room offers spectacular views in every direction. 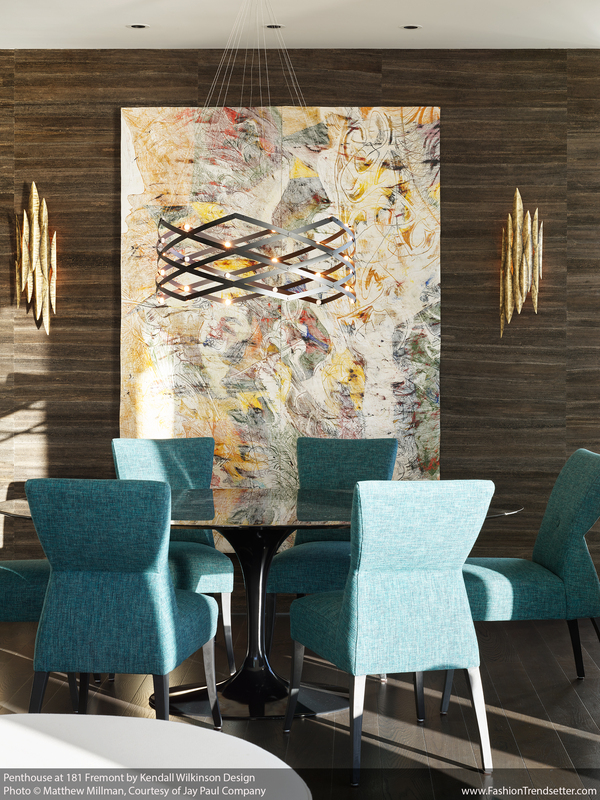 Distinctive furniture pieces including armchairs by Parisian designer, Jean-Louis Deniot, offer a pleasing juxtaposition to the home’s angular architecture, creating an inviting environment for residents and guests alike. Adjacent to the living room, the den serves as a multi-faceted space that can function as a private retreat, office, media room, or an additional room for entertaining guests. The den boasts a private bar, television and open shelving of antique brass with integrated lighting for a touch of KWD glamour. An impressive custom-made sliding glass door divides the two spaces – allowing for complete privacy while maintaining unparalleled views and a sense of openness, even while closed. 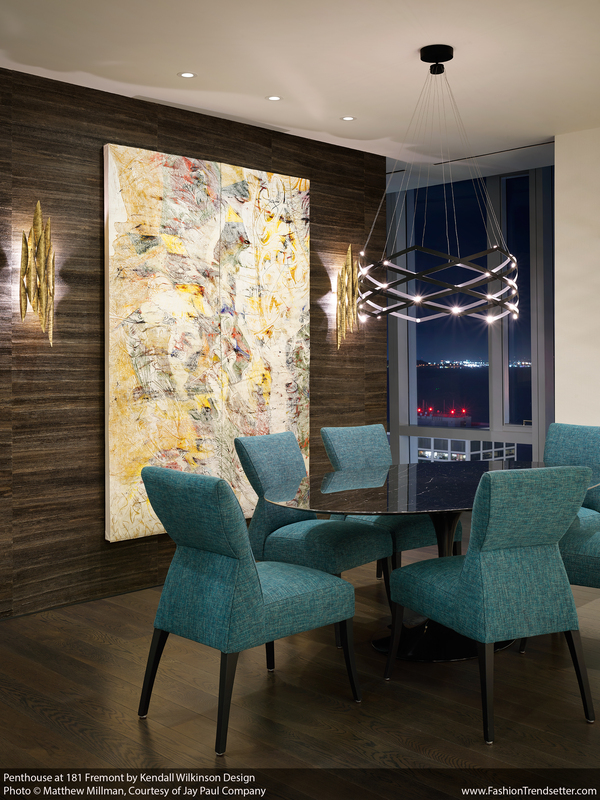 The model residence’s sophisticated dining room is outfitted with an expandable chandelier by Peter Bristol, a distinguished Apple product designer, and turquoise Brueton dining chairs reproduced from their 1980s designs. 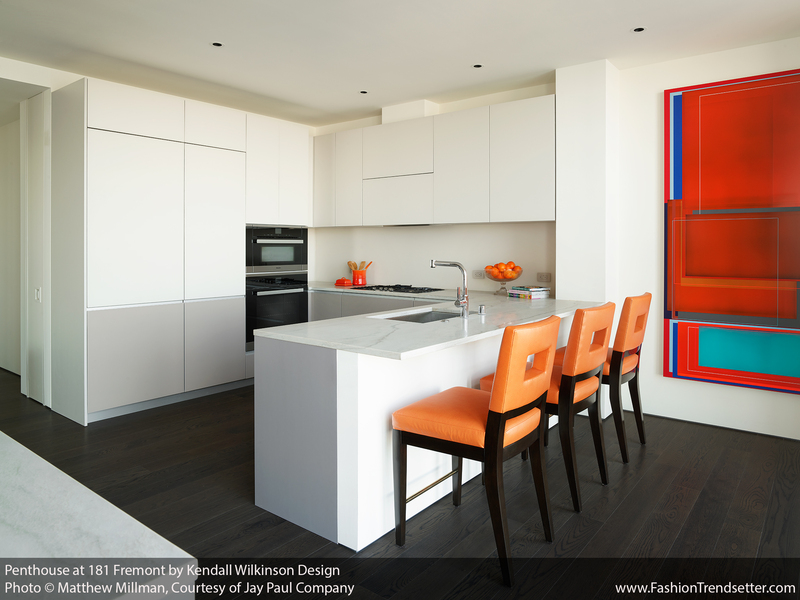 Moving through the Penthouse’s open layout into the kitchen, the eye is drawn to bright hues in Dancer – an acrylic abstract canvas displaying colorful multi-dimensional geometric shapes by artist, Patrick Wilson. 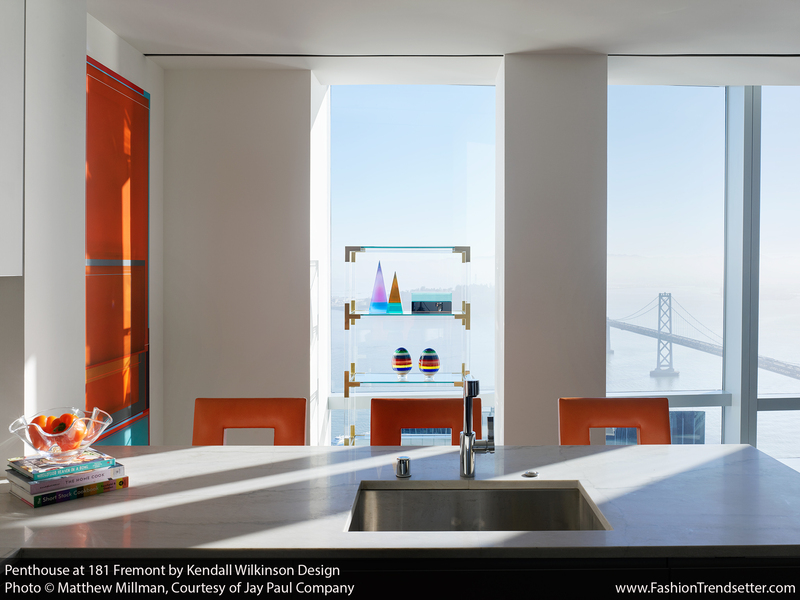 KWD designed the space to be playful, adding orange leather counter stools to the kitchen island and an acrylic shelving piece adorned with colorful, sculptural prisms to add elements of fun without taking away from the dramatic views of the ocean and Bay Bridge. 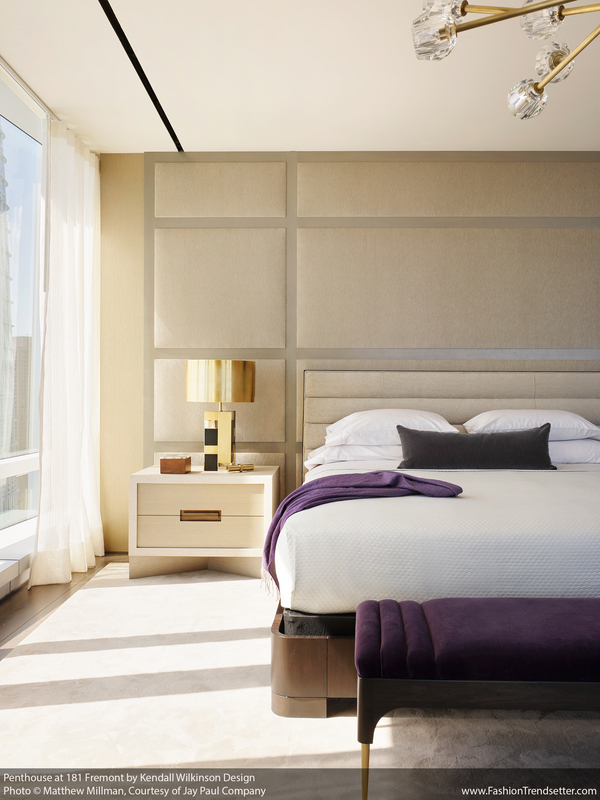 Located on the southwestern wing, the Penthouse’s master bedroom is fitted with elegant white- and gold-accented décor contrasted by hints of rich aubergine, playing into the residence’s theme of negatives and positives. Handmade wallcoverings by Los Angeles-based designer, Robert Crowder, and a pink-hued acrylic canvas by Yunhee Min, adorn the walls. Along with a sleigh bed designed by Jean-Louis Deniot, the bedroom boasts a comfortable seating area for a secondary place to watch television or to simply enjoy the spectacular views with one’s morning coffee or nightcap before bed. 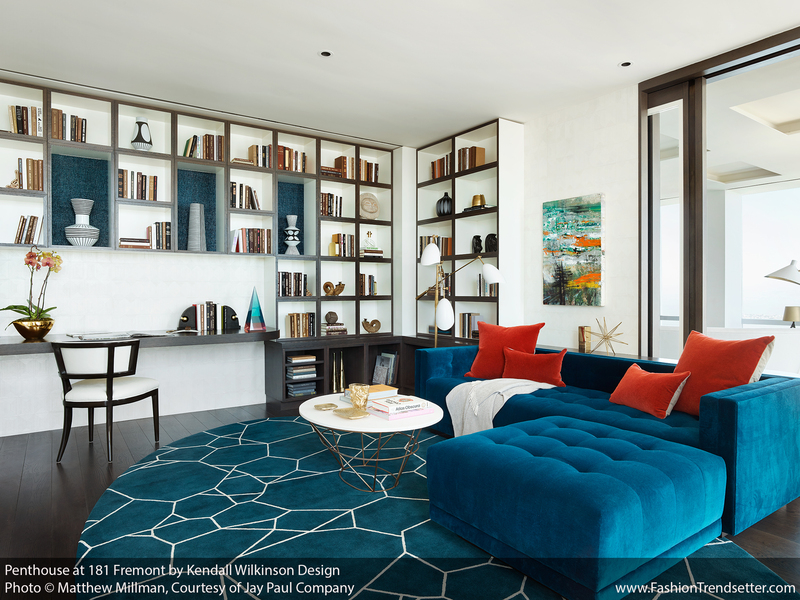 Celebrated as one of the nation’s most highly regarded residential designers in the West, Kendall Wilkinson of Kendall Wilkinson Design, a California native, discovered her passion for design throughout Europe, specifically Paris, where she took note of the City’s architecture, antiques and decorative arts. Mastering the art of combining authenticity with contemporary design, Kendall is one of the most sought-after designers for leaders in tech, finance, retail, and hospitality. 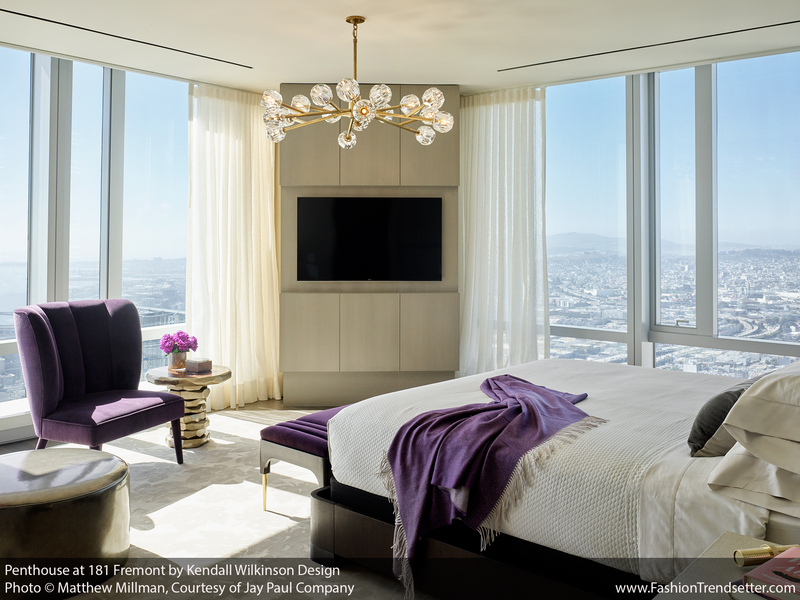 Wilkinson seeks to breathe life into each space, blending the old and the new, a concept seen throughout 181 Fremont’s Penthouse with curated and custom furnishings representing a spectrum of time periods. 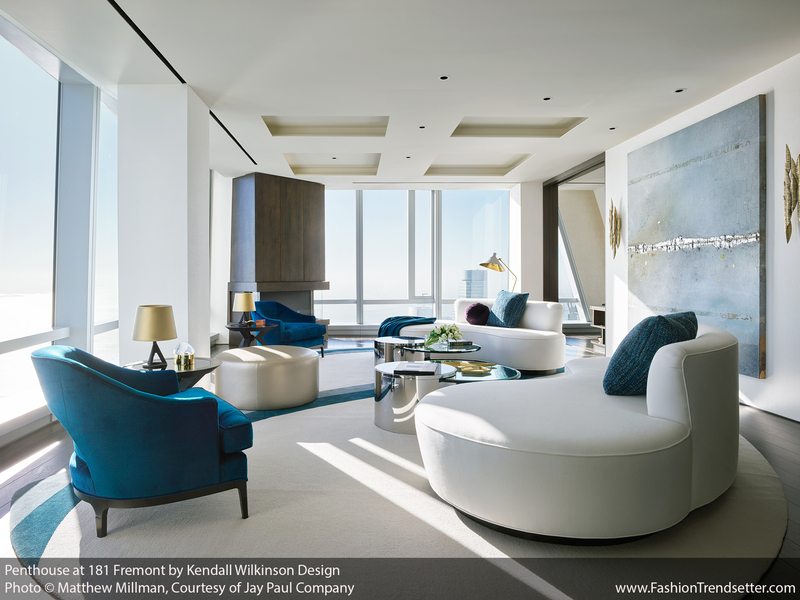 KWD’s impeccable penthouse design complements the existing finishes, all catering to a discriminating buyer from museum-style walls, kitchens with Italian-crafted Valcucine glass cabinets and Brazilian Macaubas quartzite countertops to Calacatta Carrara marble framing the entryways, doors encased in Paldao wood from New Guinea, and custom brass door handles by Parisian artist, Daniel Povda. 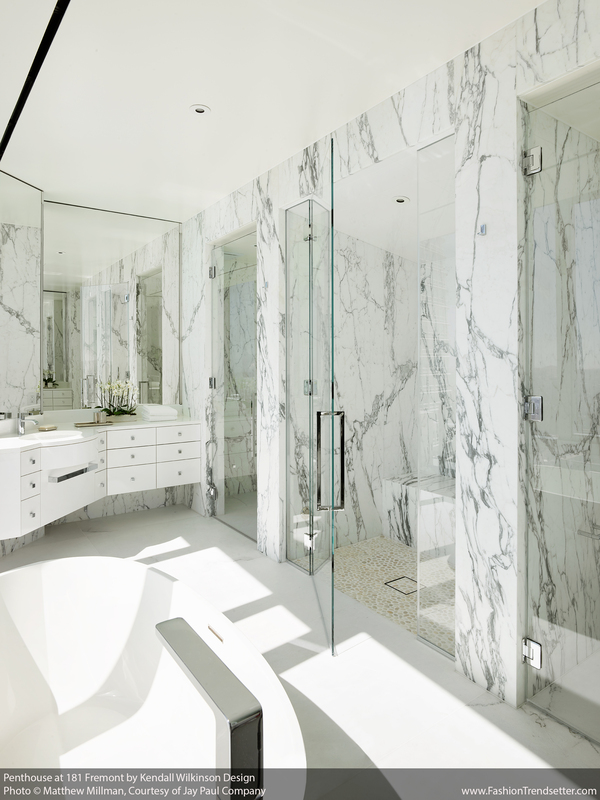 The elegant bathrooms are adorned with full-slab Arabescato Corchia marble, hand-selected by Diaz-Azcuy in Italy and placed in symmetric patterns to elicit beautiful veining designs. 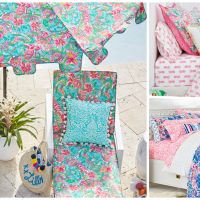 Bathrooms include large soaking tubs, showers and dual-vanities. 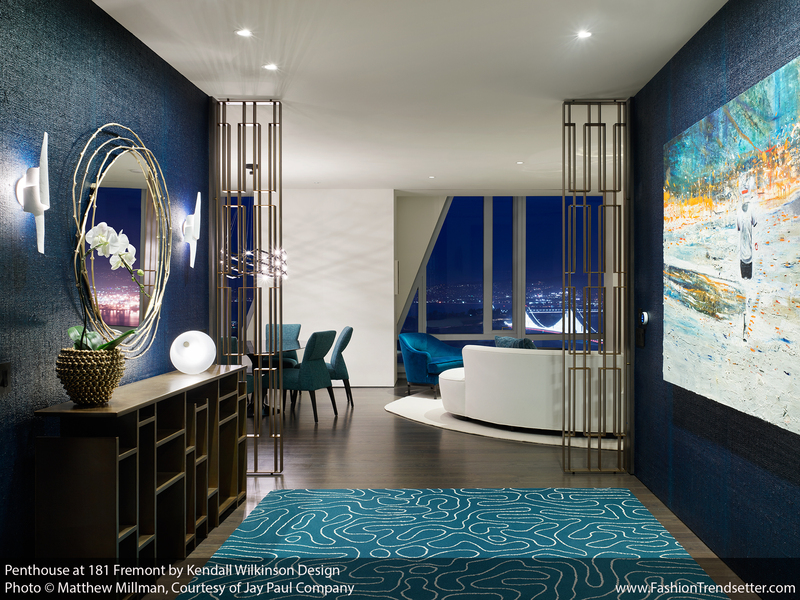 181 Fremont’s exceptional design extends beyond the Penthouse. Master designer Orlando Diaz-Azcuy and his firm, ODADA, designed the building’s resplendent interiors including the residential lobby and 7,000-square-foot Sky Lounge amenities floor, which features a wraparound terrace. 181 Fremont’s esteemed art consultant, Holly Baxter, traveled the world to acquire noteworthy pieces for residents’ permanent enjoyment in the shared areas, including Eva Rothschild’s striking 9-foot sculpture, Bright Eyes, located beneath the lobby’s gold dome, and Shahzia Sikander’s The Six Singing Spheres #6, which resonates with the shape and form of the room and the poetic nature of its design by ODADA. Developed by Jay Paul Company, 181 Fremont is the tallest mixed-use tower West of the Mississippi. 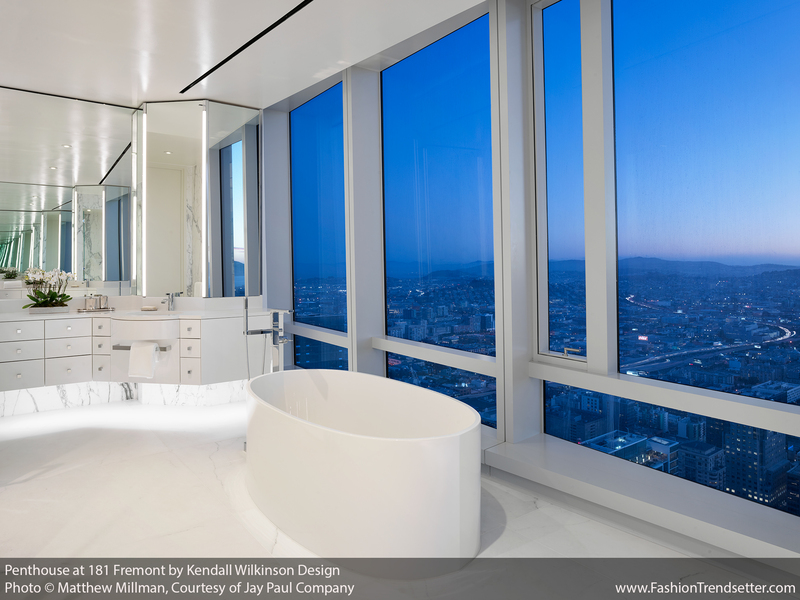 181 Fremont rises 802’ from the heart of San Francisco’s new downtown to transform the skyline. The $850 million tower features a state-of-the-art exoskeleton designed in a saw tooth pattern, with a magnificent spire that ascends from the crown of the building. 181 Fremont sits at the centerpiece of the new downtown and reaffirms San Francisco as a global city on the forefront of innovation and design. 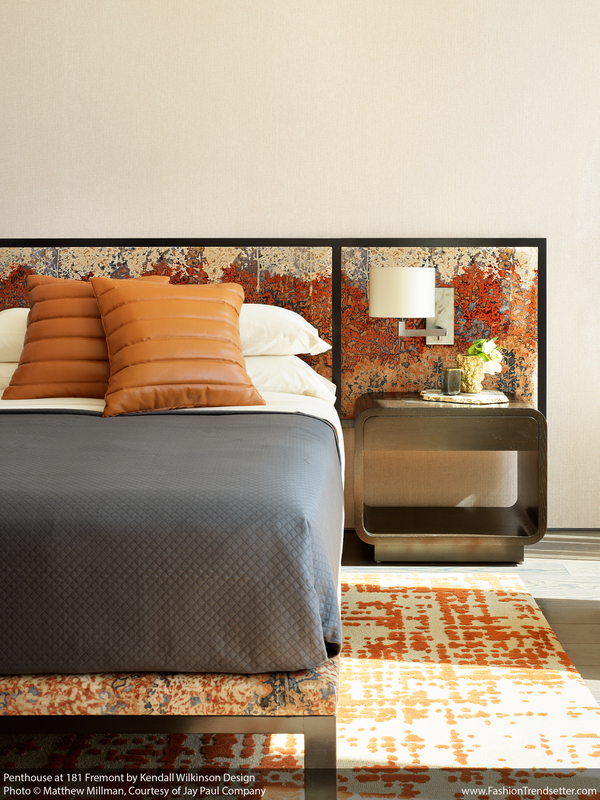 It stands to redefine not only the neighborhood, but also the very definition of San Francisco living. 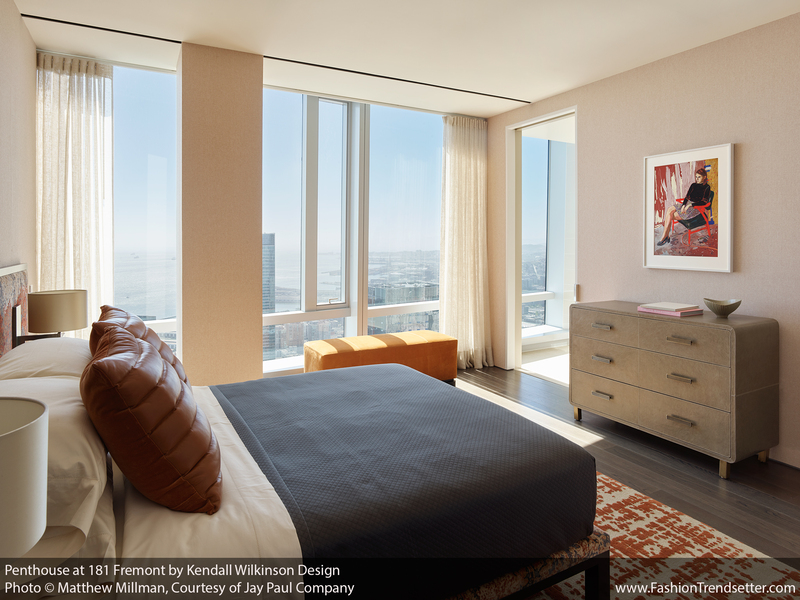 Exclusivity at its finest, 181 Fremont provides access to the entire city all from the privacy — and security — of home. 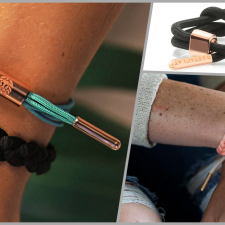 Jay Paul Company is a San Francisco-based privately held real estate firm. Over the past 35 years, the company has developed more than 8 million square feet of prime office and research space throughout California—with an additional 6 million square feet in active development—for the high tech, bio science, defense and retail industries. Led by industry leader Jay Paul, the company specializes in the acquisition, development and management of large scale, environmentally sustainable projects for such companies as Apple, Comcast, Northrop Grumman, Hewlett-Packard, Microsoft, Google and Amazon. The Mark Company is one of the nation’s premier urban residential marketing and sales firms. 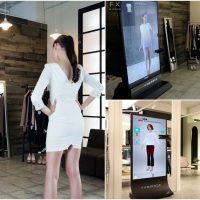 Founded by Alan Mark in 1997, The Mark Company provides a full range of core consulting services including analytics, design, marketing and sales for urban high-rises and suburban attached properties throughout the Western United States. The firm is a trusted partner to global leaders in residential development and finance, providing buyer-driven sales and marketing strategies that produce industry-leading results. 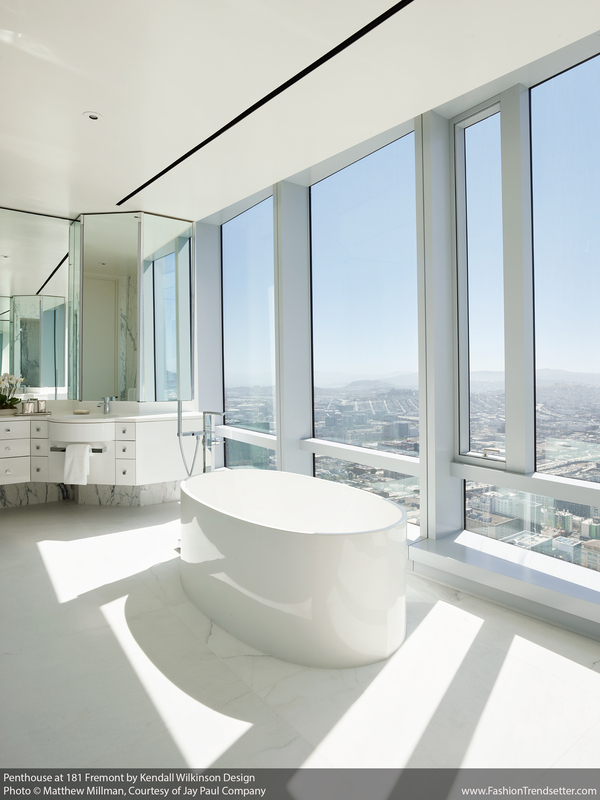 The Mark Company has represented more than 10,000 residences and generated over $5 billion in sales for some of the nation’s most notable and successful developments including The Infinity in San Francisco, Evo in Los Angeles and The Martin in Las Vegas. 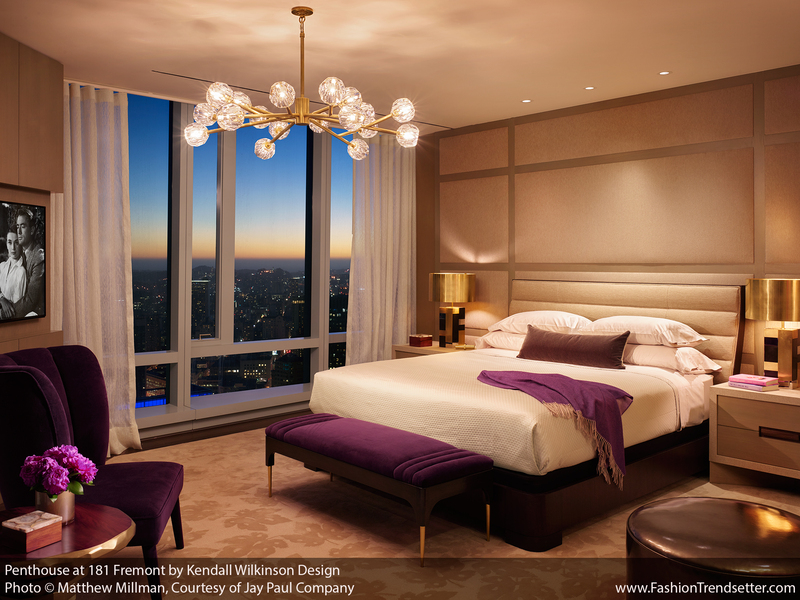 Along with 181 Fremont Residences, other current projects include The Austin in San Francisco and Cavalleri in Malibu. A subsidiary of Pacific Union International, one of the San Francisco Bay Area’s top-performing resale brokerages, The Mark Company benefits from an enriched leadership team, enhanced technology and added global reach through its affiliation with Christie’s International. 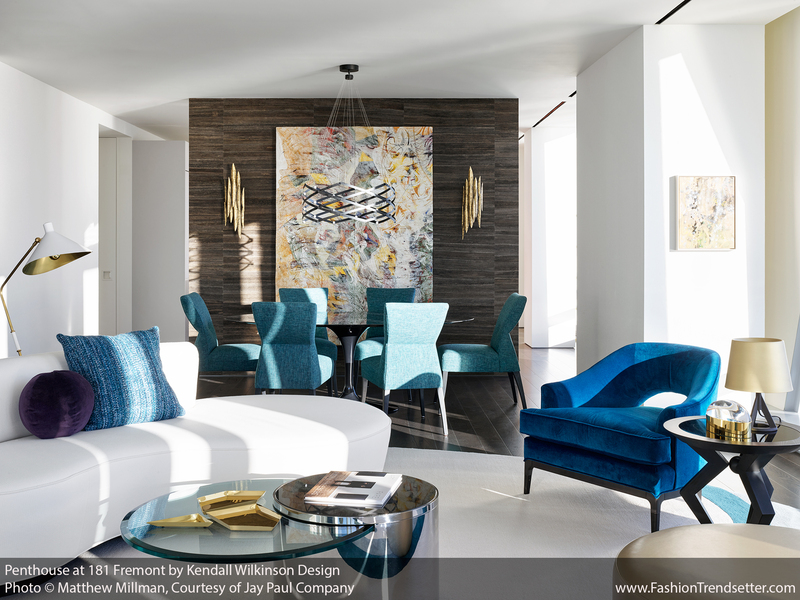 A California native with a timeless sensibility, Kendall Wilkinson has emerged as one of the nation’s most celebrated interior designers. 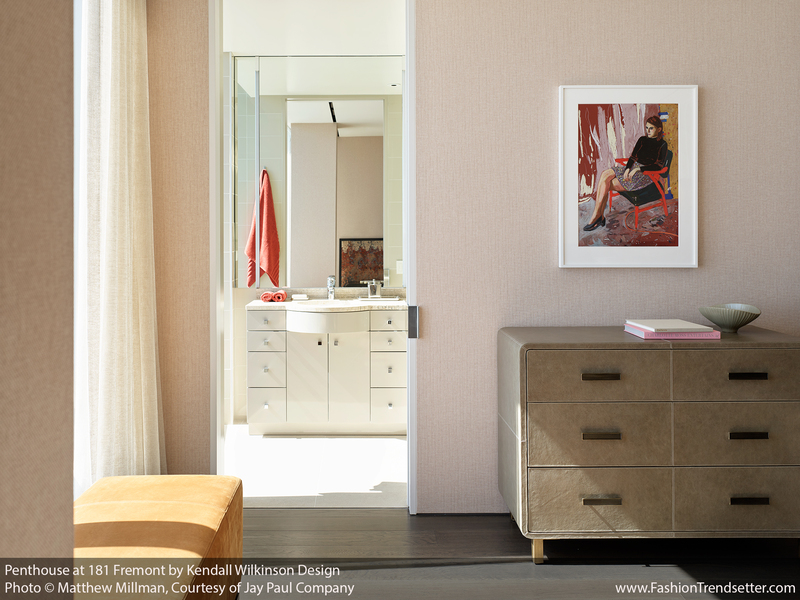 Establishing her eponymous San Francisco firm in 1992, Kendall creates bespoke residences with an emphasis on beauty and comfort. 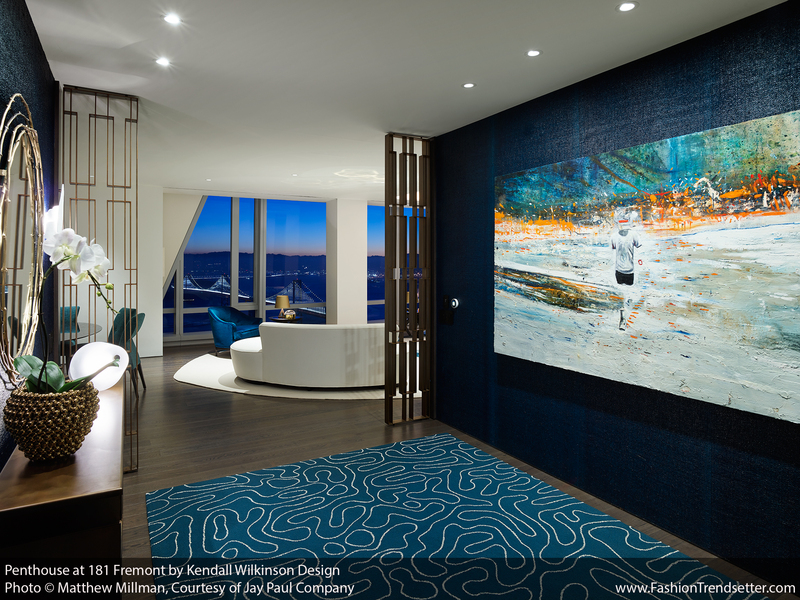 Over the last 25 years, Kendall Wilkinson has become one of the most highly regarded residential designers in the West. 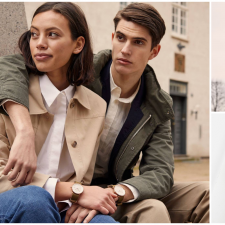 Mastering the art of combining classic with contemporary design, Kendall is one of the most sought-after designers for leaders in tech, finance, retail, and hospitality. 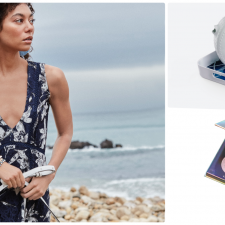 Her portfolio ranges from Pacific Heights estates to coastal Mexican vacation getaways. Geographically her projects span the nation and beyond. 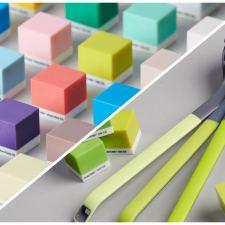 All images © Matthew Millman, used by permission, courtesy of Jay Paul Company.